We provide a handy tool and APIs for breakdown of hosts and their infrastructure. The platform obtains data from various providers and our own substantial internal databases (put together for over 10 years), analyzes host configurations in real time, and offers an in-depth perspective of the target host. It is a building block in your toolkit for threat detection. Get an instant breakdown of the host and the infrastructure behind it through the web interface. your system, boosting it with a better threat intelligence analysis. Get a collection of a particular domain’s web, mail, and name servers along with its known subdomains. Identify each infrastructure entry’s IP address, physical location along with its subnetwork data. Get a breakdown of a particular domain’s SSL Certificate and the complete SSL Certificates chain. The information is provided in a unified and coherent JSON format for easy integration with your system. For a particular domain, identify and analyze SSL connection to the host and analyze its configuration so as to detect likely issues that might lead to vulnerabilities. For a particular domain, find out whether it is deemed malicious by established security data sources. Malicious domains may be linked to a network of malware distribution or host a hostile code. Get a list of domain names, which includes subdomains, that resolve to a given IP address. Make sure your website doesn’t share its IP address with any malicious domains, as that is likely to lead to overblocking – a situation when a blocked malicious site leads to the blocking of other sites with the same IP. Investigate the infrastructure of linked domains. Use multiple security data sources along with an instant host's audit procedure to assess a domain's reputation. Collect and assess over hundreds of parameters for a particular domain, and get the reputation score based on them. No credit card or company details required. 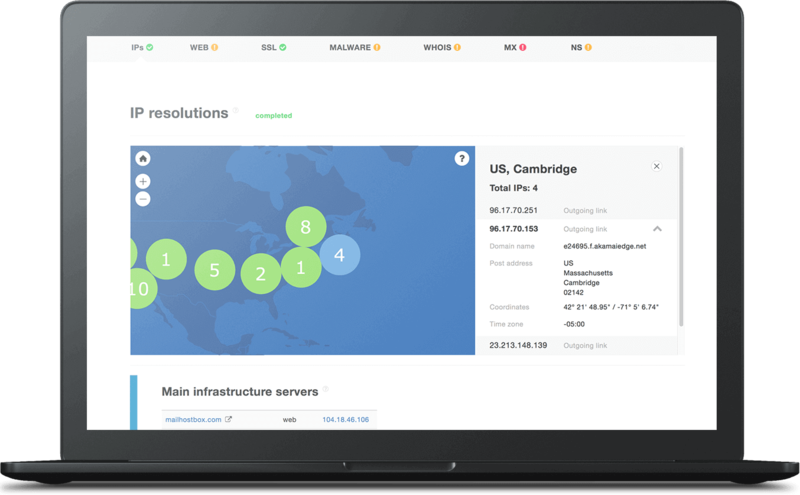 Analyze the infrastructure of a host, get its IP addresses along with their physical/ASN distribution and see how the results compare to those of the reverse IP lookup. Conduct an analysis of the domain's SSL (HTTPS) certificates, research its SSL connection and configuration. Analyze the content, its relations to other domains and host configuration details. Check if the domain is deemed malicious in established malware data feeds. Obtain, output and analyze the WHOIS record of a domain name. Check configuration of DNS MX records and examine the corresponding mail servers. Check configuration of name servers, output details and likely configuration issues. Give the platform a try!